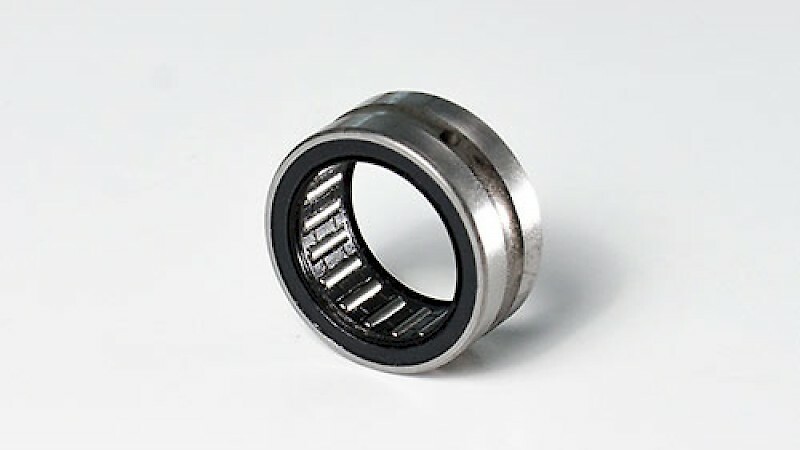 Needle bearings are basically cylindrical roller bearings with rolling elements that are significantly longer in relation to their diameter (1:2.5 to 1:10). These cylindrical rollers are called needle rollers. Their design makes needle bearings more compact which means they require a relatively small design space despite their high load-bearing capacity. In addition, they weigh less, thus reducing the amount of material used. In other words, the use of needle bearings reduces machine costs. Experts distinguish between needle bearings with cage and cageless needle bearings. Relevant standards are DIN 617 and ISO 3245 (needle bearing with cage) and DIN 618 (drawn cup needle bearings). Cageless needle bearings can support higher loads due to the larger number of rolling elements used. Due to the mutual needle contact and the tendency of the needles to tip, needle bearings with cage are used where higher dynamic loads are involved. The needles are tapered at both ends. The narrow ends of the needles are convex or flat. Needle bearing can only support radial loads and have to be aligned exactly in terms of radial bearing slackness and operating temperature. Needle bearings are particularly rigid and insensitive to impact. They are available with and without inner race as needle roller and cage assemblies, drawn cup needle roller bearings with open ends or closed ends. They can support very high radial loads where space is limited. Typical areas of application include vehicle engineering, packaging machines, printing machines etc.. It's true to say that needle bearings are first choice where space is tight and speeds are low to medium. The needle bearing range is rounded off by support rolls and curve rollers as well as combined needle bearings as special needle bearings. The perfect design of a needle bearing element including lubrication and sealing is one of the core competences of the specialists at Wälzlagertechnik.